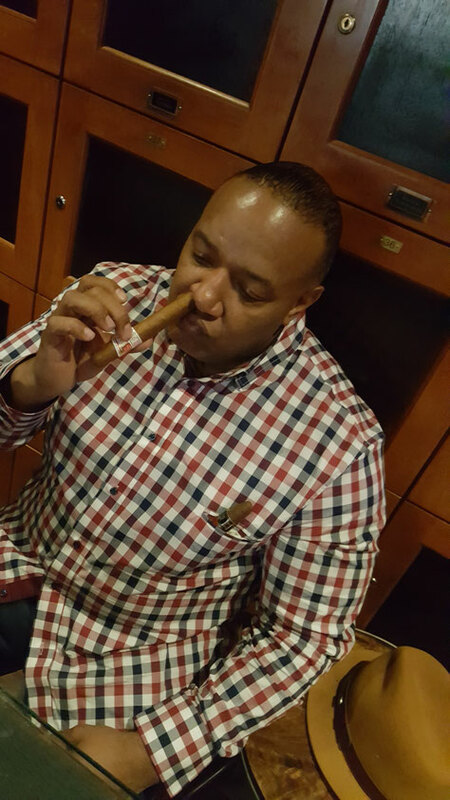 Its Saturday night and there is no other place that I would rather be than the Cigar Inn on 2nd Ave between 53rd and 54th St NYC. I decided to wear one of my favorite cigar shirts, the Leaf&Barrel Wine and Gingham, and to compliment the colors of the shirt I wore dark navy blue slim fit Brooks Brother chinos, a pair of Double Monk-strap British Tan Cap toe shoes, and a matching British tan Ferragamo belt. To top it off I decided to err on the side of contrast with a orange brown wool Fedora (seen in the bottom right of the photo). Before I stop in I opted to buy a bottle of Michter's Straight Rye Bourbon at "You and Me Wine and Spirits" on the corner of 54th and 2nd Ave. Its the perfect place to buy a bottle before walking in the lounge (only 50 feet away) due to a vast selection of spirits in all price ranges. Since switching owners a about 2 years ago the Cigar Inn (now referred to as Casa De Montecristo) has changed for the better aesthetically and the prices of the cigars are more buyer friendly. I was surprised to see that the new BYOB policy now requires a purchase of two cigars (fair enough). I started with a AVO Heritage (slowly becoming one of my favorite cigars) and ended the night with a Ashton VSG (Virgin Sun Grown). On this special night I am joining a friend that just returned from Cuba and he had the kindness to bring back one of my favorite cigars, the Hoyo De Monterrey Epicure #2 and a bottle of Havana Rum. Can it get and better? I think not. We discussed the particulars of his trip to Cuba, updated ourselves on family status, and veered off into how to make the best roasted chicken. We ended the night at the Brooklyn Diner on 57th street and ordered two of the best dam Chicken Pot Pies you can ever taste (seriously, do not be aforesaid to copy every step of this wonderful night). I told him that nights like these are the best of times. Rum, bourbon, Cuban cigars, good conversation, great food, the cheerful banter of friendship, New York City in the backdrop, and good heath. Night like these define what life is all about.